Recently, my son Joe had his fourth birthday. 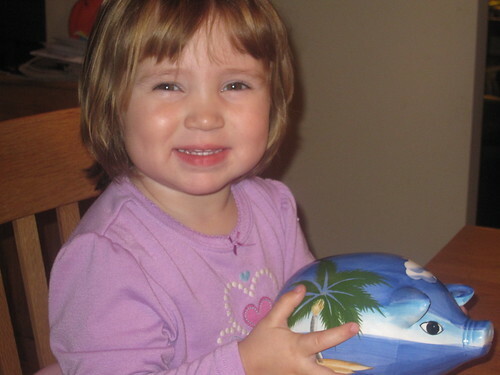 Sarah and I had made the decision that we were going to introduce the idea of an allowance to him after his fourth birthday, along with the idea of saving for specific goals. What is a “Money Savvy Pig”? As you can see from the picture above, a Money Savvy Pig is a bank with four distinct compartments: Save, Spend, Donate, and Invest. The bank has four slots along the top – one for each compartment – and each of the pig’s feet provides access to one of the chambers to empty it individually. The idea behind it is pretty simple – it makes it very easy and tangible for children to separate (and effectively budget) their money. Each week, we’re giving him $2 in quarters for his allowance – $0.50 for each year he’s been alive. Thus, next year, he’ll get $2.50. We may at some point in the future change this rate, but it works for the time being. He then splits the money into four roughly equal amounts. Two quarters go in the “Spend” slot, two quarters go in the “Save” slot, two quarters go in the “Donate” slot, and two quarters go in the “Invest” slot. He is completely free to spend all money that goes in the “Spend” slot as he wishes. If he wants, he can take that money and put it in the other slots in his bank, or he can put it in his pocket and take it to the store with him to buy something small. With the “Save” slot, we had him identify something that he wanted that was much more expensive than a dollar or two. We told him to think about it and later he told us he was saving for a Batman action figure that costs about $10. So, we told him that he could keep adding to the “Save” slot and in a few weeks, we’ll count it up and see how close he is to it. With the other two slots, we told him that for now, they’re going to just build up. For the “Donate” slot, we’re talking right now about the various things that people can donate money to – the local church, the local food pantry where people who don’t have much money can get food, Heifer International, PBS, and so on. We told him that when he gets $5 in that slot, he can pick something to donate to. He has expressed positive interest in donating to PBS, so I more or less expect that to be his first donation in two months or so. For the “Invest” slot, we’ve told him that it’s just going to build up for a while. Our plan with that is to wait until there’s a “lot” of money in it (from his perspective). Then we’ll use that money to introduce various ways to invest, starting with a savings account at the local bank. Does a Four Year Old Understand All of That? No, nor do I expect him to. 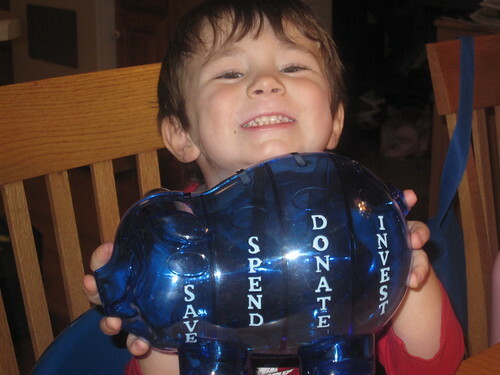 We’ve started doing this when he’s young so that saving seems like a completely natural thing to him as he becomes more aware of money and how a person can use it. I don’t expect him to fully understand, and he doesn’t. For now, he really only understands the “spend” part and the “save” part of the bank – the other two are mysterious. We are quite sure he understands the “save” slot. We told him that he’s free to put any money he gets as a gift into any slots he wishes and he chose to put almost all of it into the “save” slot because he wants the Batman action figure that he had chosen as a goal. He put a smaller portion of it in the “spend” slot and a bit each in the “invest” and “donate” slots. We’re also quite sure he understands the “spend” slot, since he wanted to take a dollar out of it a couple of days ago to buy a Hot Wheels car for the race track his grandparents gave him for his birthday. We, of course, approved this, since it’s money he can spend as he chooses. The other slots are a mystery at this point – they’re clearly there for him to grow into it. Joe has a two year old sister who loves to do exactly what her big brother is doing. So how are we handling that? We decided to start her on an allowance, too, but a much simpler setup is in the offing for her. For her, we’re just giving her four quarters on allowance day (again, fifty cents for each year) and allowing her to put it in her bank. We don’t have any rules on how she can use it, but for now they’re really not needed. She simply enjoys putting “monies” in her bank, just like her big brother. When she’s four, if Joe is seeing success with his bank and we’ve seen it as a valuable tool, we’ll get her one, too. One big reason for doing this is the idea of peer reinforcement. If they’re both saving together, it seems more normal. It isn’t just them doing it – one of their peers is saving, too.